Manila's a tropical wonderland all year round, and so when jetting off to snowy spots, we don't blame you for being a tad stumped. What is a girl supposed to wear, even? After all, you don't want to look like you simply threw on lumpy layers just for the sake of keeping warm. 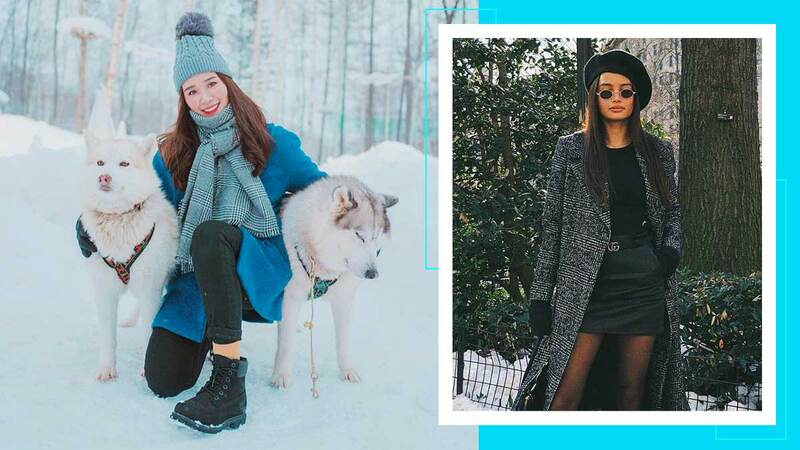 Here, let these chic ladies solve your dilemma—pegs to keep you stylish even in the extreme biting cold. Frosty, but cute! Match your too-necessary knit accessories like Tricia Gosingtian does! There's also a monochrome styling tip to glean: her powder blue hat and scarf complement her cobalt coat perfectly. Icy non-hues get a trendy, sporty update care of Martine Cajucom. Why not twin with the slopes? Now's the time to take advantage of the warmth faux fur and high-shine leather lend. Jeline Catt knows best. If you're flying off to a big metropolis for the winter, wearing skirts or dresses is a lot more doable than in the snowcapped mountains. Simply tuck thermals underneath, then top off with a chic plaid suit jacket à la Renee de Guzman. You just can't go wrong in all black. Ask our resident VS model Kelsey Merritt! A beret and Lennon-esque sunnies are a cool touch. Head-to-toe yellow is the way to go, according to Heart Evangelista. Just make sure your 'fit's in the toastiest cashmere ever! We love this trick courtesy of Sam Richelle! Throw a leather moto jacket over a scarlet hoodie for a look that's equal parts biker babe and street smart. Nicole Andersson's wide-leg trousers and statement coat make for quick chic. Cropped teddy coats are actually a huge trend overseas where temperatures drop to negatives! Always ahead of the curve, Kim Jones got the memo ages ago. Jess Connelly's constantly the coolest, rocking a full Pepto-pink tracksuit under a glam fur shrug.